Iain Duncan Smith was reported today at The Broken of Britain blog as having used the accessible loo at a Covent Garden studio causing a disabled person to have to wait in some pain. While that was undoubtedly an embarrassing moment for him it looks that he was not overly welcomed when he was down under either. Iain Duncan Smith, a former Tory leader and now a Cabinet minister, is speaking at the Maxim Institute’s annual Sir John Graham Lecture at the Heritage Hotel. Ms Bradford, a former Green MP, said Mr Duncan Smith’s “horrendously damaging” welfare reforms in Britain, which include cutting housing benefits for thousands of low-income families, inspired many of the proposals by economist Paula Rebstock’s Welfare Working Group in NZ. Government decisions on the Rebstock report are expected before this year’s election. Why is he visiting and why should New Zealanders to be vigilant about his message? The answer is that the New Zealand government is about to drive through similar welfare ‘reforms’, otherwise known as cuts, following the work of its Welfare Working Group which was appointed in 2010. The WWG reported on 22 February 2011, an hour before the destructive Christchurch earthquake. The signs weren’t good. Many of us have been watching with horror as the welfare ‘reforms’ have been rolled out in Britain. The justification is that there is something evil called ‘welfare dependency’ that many poor and disabled people and single parents suffer from, and which can only be cured by paid work, preferably fulltime. Mr Duncan Smith expressed his underlying assumption for this policy – that welfare dependency leads to ‘worklessness’ (not the other way around). But I suggest there are two basic things missing in this equation: the role of the government to create jobs; and the role of the state in ensuring the dignity of all its citizens. He did not apologise for, or even acknowledge, the role of neoliberal policies under Conservative leader Margaret Thatcher which destroyed industries and millions of jobs. Yet he claimed that one million people will be lifted out of poverty by these reforms. These assumptions are underpinned by an absolute belief in the moral good of paid work and the lack of value of any other kind of work including voluntary work or child rearing. The Tory minister said that it is very important for the child of a single mother to see his/her mother go off to paid work every day as that would normalise ‘work’ for the child. The only unresolved question, he suggested, is what age that should happen. In New Zealand proposals the child could be as young as 14 months. In Britain it is five years old. When a member of the audience asked about creating work he replied with a sigh that he thought we had moved beyond that question. He said it is the private sector’s job to make jobs and the state’s only role is to make things easy for the private sector to do that. He claimed that the private sector had created half a million jobs in the last year but – wait for it – British people didn’t want them so they had gone to ‘immigrants’. So if the hundreds of thousands of unemployed British people are ungrateful and lazy, what does that say about disabled people? For disabled people in Britain currently on welfare the first step out of ‘dependency’ is an assessment for ‘workfitness’ (a term that harks back to eugenics). To assess the ‘workfitness’ of disabled people, a private multinational company, Atos, has been contracted to do a tick box computerised assessment without any contextual information such as mental health or disability history. Depending on what an individual scores they can be placed in three categories: work fit and ineligible for even basic employment support, work fit with employment support, and not work fit (ie unfit). It is easy to imagine how aspects of a condition such as autism are overlooked by medical questionnaires which ask questions such as can you walk, or dress yourself. There are incentives such as rewards of additional contracts for the company to push people off the welfare system, and its profits are currently at record levels. But it seems there have been so many challenges to the insensitive and inaccurate assessments that the system can’t cope. As well as workfit tests, there are also cuts to other aspects of the welfare system such as allowances for housing, programmes, and disability support including such things as continence supplies. There have been reported suicides, and regular reports of disabled people suffering because, for example, they can’t afford adequate housing and families unable to get supplies for their disabled children. Mr Duncan Smith has also distorted the concept of social justice, with its implications of equity, inclusion and bottom up social policy, by using it for the name for his own right wing think tank, the Centre for Social Justice, whose purpose appears to be championing policies to inflict social injustice on the poor and powerless. It is rare for us here to have the chance to get up so close with someone so powerful, so I listened carefully. After all, there is the equivalent of the population of NZ on welfare in Britain, out of a population of 62 million. He is a very smooth and persuasive talker, obviously clever, and had the look of someone who has been well nurtured with a comfortable life; I suppose you don’t get to be head of the Conservative Party without these attributes. So how can he justify the misery and pain his policies are so clearly causing? He is not evil and is clearly genuine concerned. One of my interests is ethical public policy*; I think that the only way powerful people can inflict such policies on other people is by seeing them as ‘other’ not fully human, or objects of scorn or laziness. Interestingly, in Britain the opponents of these policies have adopted the black triangle – the Nazi symbol used to classify the ’workshy’, one of their ‘othering’ labels – as their campaign symbol. So at question time I asked Mr Duncan Smith whether it worried him that his policies might be hurting real people. He initially didn’t agree, blaming misinformation campaigns and claiming disability groups had asked for these changes, but it clearly needled him. I think this is the way to challenge those whose policies risk hurting and harming other people – as human to human. And we need to keep doing it otherwise inequality and suffering will only increase. Alternatively, we can always hope that politicians will actually ask real people for input into policy, and listen to the wisdom that comes from their lived experience. But not much sign of that happening. Disabled People Against Cuts stands in solidarity with New Zealand campaigners against poverty. As British Government Secretary for Work and Pensions Iain Duncan Smith prepares to speak, disabled people in Britain want you to know the dangers of following a British approach to welfare reform and the threat that it represents to your equality, human and civil rights. The Coalition government which came into power in Britain in May 2010 made rapid and sweeping changes under a welfare to work programme that targets the poorest and the most oppressed in British society. This programme is underpinned by a deliberate ideological policy of removing support from those in the greatest need. Meanwhile so-called austerity measures are disproportionately affecting disabled people. At the same time that local governments are removing support from disabled people, central government is re-assessing the benefits disabled people rely on to survive while imposing arbitrary targets set to reduce the numbers of claimants. The Condem’s Welfare to Work vision has already costs lives. In June 2010 Paul Reekie, the Scottish author, took his own life. Laid out on the table next to him were 2 letters, one telling him his housing benefit had been stopped and the other telling him his incapacity benefit had been stopped. This is just one example of what is becoming an all too common issue. Senior government officials have acknowledged that the welfare reform programme will cost lives but they see it as an unavoidable consequence of a direction they are determined to pursue. In 2005 the previous government set a target of 2025 by which time disabled people should have equality. Without income, without housing, without support to leave the house or even to use the toilet, this target is completely unreachable. Moreover, government propaganda that paints all benefit claimants as scroungers contributes to existing discrimination against disabled people at a time when hate crime against disabled people is an extremely serious issue and the names and numbers of those killed through prejudice mount up. Duncan Smith’s Welfare to Work programme does not represent value for money and cannot be excused as a necessary austerity measure. At the same time as a recent report commissioned by the government, found that the Access to Work programme makes a profit for the government of 48p for every £1 spent, the Department for Work and Pensions which runs the programme continued its policy of cutting resources to Access to Work, with the effect of denying support to disabled people trying to get in and stay in mainstream employment. The proposals for removing Disability Living Allowance and replacing it with a system which requires continual review for people with lifelong impairments will require investment at a level which can only be sustained by removing benefits from genuine claimants. ATOS, a profit-making healthcare company, has been given a 300 million pound contract by the government to carry out work capability assessments on disabled people to review their eligibility for employment and support allowance (previously called incapacity benefit). 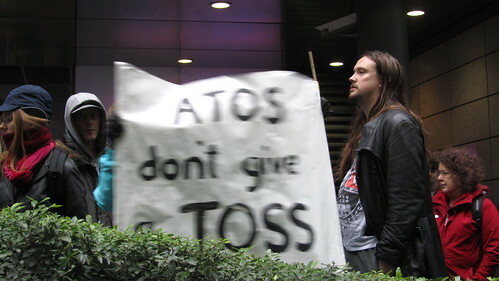 ATOS works to a target of finding disabled people fit for work and ineligible for the benefit. In order to meet their targets they disregard information from medical professionals, GP’s, consultants and psychiatrists. The advisors look for any reason to remove support. In one example a man with a mobility impairment lived in a flat which was too small for his wheelchair. When at home he uses furniture to get himself around. His ATOS assessment used this as proof that he could manage without a wheelchair. ATOS assessments are notoriously inaccurate. 40% are overturned on appeal and, with representation, that level raises to 70%. In other examples soldiers returning from Afghanistan with post-traumatic stress disorder and people with terminal cancer have been declared fit for work. Money is being spent paying private companies to find ways to declare people fit for work when they are not and to take away benefits from the poorest and most powerless members of society. Rather than being an effective use of money, this is ideological, it is about pushing those people already on the margins of society even further into poverty and obscurity. In Britain disabled people have not stood by and let this happen. We have mobilised and protested to defend our rights to the support we need to live an equal life. We urge campaigners in New Zealand to resist any attempt by their government to erode fairness and social justice the way ours has.